In 2019 brows are once again taking center stage. There a slew of new brow products out promising to give you the perfect brows. Maybelline is at the forefront of the movement with a few new products that will help with this goal. I tried out three of them and here are my thoughts. This product sculpts and tints brows for up to 12 hours. 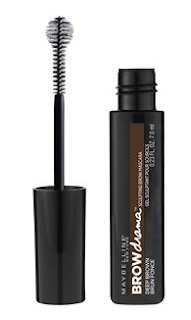 This eyebrow gel mascara tames and fills unruly brows for sculpted, full eyebrows. Use the sculpting brow ball to fill in upward lin light strokes. Follow along brow contour. It comes in 6 shades. I like this but it is a little light for me. I need something darker for my brows. This is the Auburn shade that I am using. As you can see it doesn't give me enough pigmentation on its own. I feel it would work better with a brow pencil too. Brow Precise Micro Eyebrow Pencil Makeup features an ultra-fine 1.5mm tip and grooming brush to deliver micro-precision in every stroke. Brows are shaped and filled with impeccable precision. It comes in 7 shades. I used Auburn. To be honest, I find it works best when used under the brow gel above. It provides just enough color to fill in my brows and makes them look less invisible than they already are. I might want to try a different shade, such as Medium Brown. Now, if you want something long-lasting, turn to Maybelline's Tattoo Studio Long-Lasting Brow Pomade. This is the new addition to the brow line and works wonders on brows. 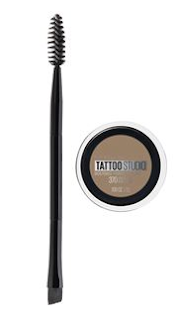 Tattoo Studio Brow Pomade Long-Lasting, Buildable Eyebrow Makeup is a highly-pigmented and long-lasting waterproof formula that sculpts and creates natural looking eyebrows. Achieve the look of full, sculpted, and natural looking eyebrows in three easy steps: outline, fill in with buildable coverage, and blend. It’s designed to perfectly match the color of your brows and is formulated for long-lasting, waterproof wear. Maybelline’s matte pomade glides on for an evenly filled in effect. The dual-ended applicator gives you the ultimate control with its angled sculpting brush and spoolie for natural shading and blending. This long-lasting formula does not smudge and does not transfer for fool-proof wear that lasts for 24 hours. It comes in 8 super-saturated shades. I used Auburn. See how much pigment it provides and how well it fills in the brows? This pomade is very nice and great at getting unruly brows in place. It is my favorite of all three products. I love the Tattoo Studio products. All of these products are available in mass market retailers such as Walgreens, CVS, Rite-Aid, Walmart, Target and Ulta. They are also available on www.ulta.com. Like Maybelline on Facebook: https://www.facebook.com/maybelline; Follow Maybelline on Twitter: @Maybelline; Follow Maybelline on Pinterest:http://www.pinterest.com/Maybelline/; Follow Maybelline on Instagram:http://instagram.com/maybelline# and Follow Maybelline on Tumblr:http://maybelline.tumblr.com/.